After working through the Tour of Heroes tutorial in the Angular 5 docs, I wanted to better understand a concept that was new to me: Observable. With that in mind, I started working on my own Tour of Cats 🐱, which I will reference below. For this post, I’m going to focus on how Observable handles async data requests. To get the most out of the post, it would be great if you knew the basic fundamentals of Angular 5. In the Tour of Cats, the app fetches cats from a backend service, which is an asynchronous operation. How can we handle this async request? Observable, to the rescue! Observable is returned by the Http call, and it will include a sequence of items that arrive asychronously over time. Here is an example of the CatsComponent. 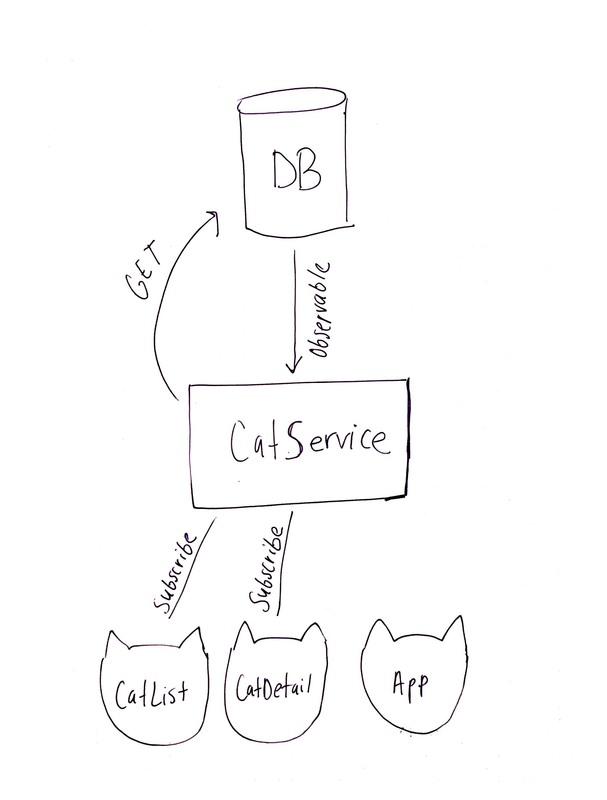 See that the getCats() function calls into the service, which will return an Observable. Then, it immediately subscribes to the results from the Observable with subscribe. Once the Observable is hydrated with Cat objects, the callback function will be executed, which sets the component’s cats property, causing the component to render the new list of cats. As you can see above, only components that are subscribed to receive the Observable will receive the new list of cats. They can do whatever they want with the data once they have it. As mentioned before, the CatsComponent may render only the name of cats, while CatDetails may render more specific details, such as a picture and the number of lives the cat has left.